The Maxwell Line for The Meadowbrook Linden home. Is it possible to have The Loft style in a low-prim package? I was recently invited to be the first designer in Prim Perfect’s new project highlighting Linden Homes. These homes, a benefit for those with Premium membership, come with a 117 prim limit. Prim Perfect magazine will showcase in each issue one of the styles of Linden Homes, fully furnished by a designer. 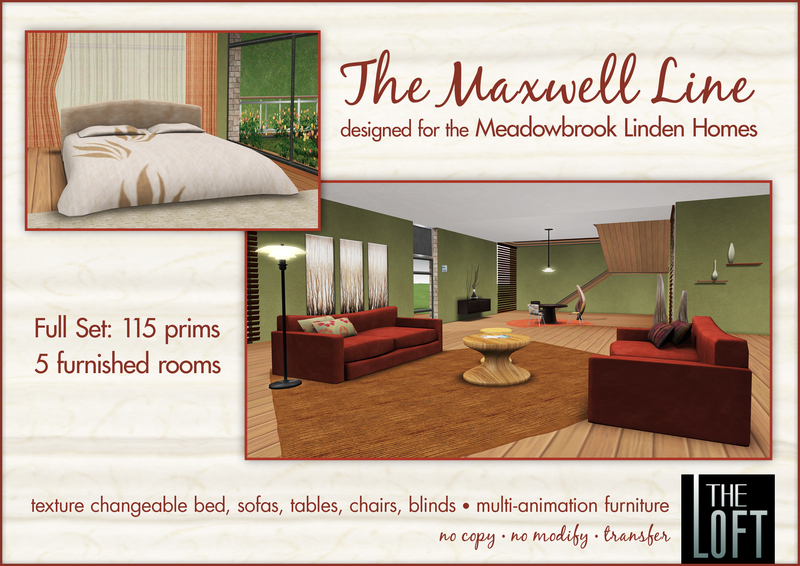 Now available at the Loft is the Maxwell Line created specifically for the Meadowbrook Linden Homes. Almost every piece of furniture in this line is texture changeable allowing you to easily customize your space. Bed,sofas and loungers all contain both singles and couples animations. As a special introductory offer I have made 40 packages containing the entire line, all 5 rooms, for L2500.00. If you would like to check out a lay out of these items in one of the houses teleport here. Teleport to the Loft .